With this plan, you have plenty of time to check in early or late. And there is no need to worry about missing the hot spring as it is open 24 hours. 8,925 - 9,975yen per person (price depends upon available size of room for this plan). 13,650 - 15,750yen per person (price depends upon available size of room for this plan). 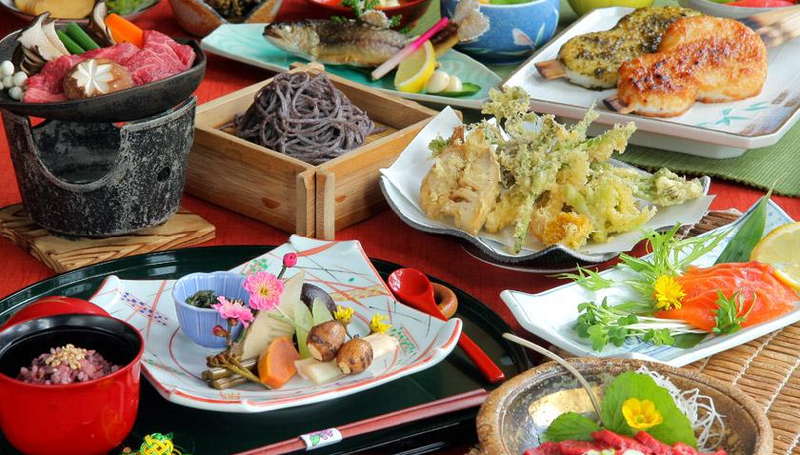 The Shinshuu area is famous nationwide for our local dish called "Goheimochi". This plan includes this famous local dish topped with our special home-made sauces. This is guaranteed to satisfy any hunger. 14,700 - 16,800yen per person (price depends upon available size of room for this plan). This area is most famous in all of Japan for apples. This plan includes our very own creation of very beautiful and tasteful apple cocktail. Possibly the first ryokan to offer a taiko drumming plan, Misaka specially offers this plan for those who wish to discover the hidden power of Shinshu Nagano. Enjoy a day of taiko drumming taught by professional taiko drumming group, Wadaiko Tokara. Then enjoy a relaxing hot spring bath and a succulent dinner. An absolute must for first-time visits to Japan.